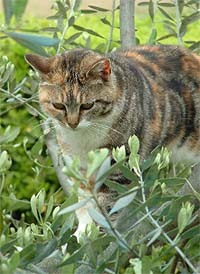 Your cat can't always tell you where it hurts, or cats may mask their pain (a survival behavior in the wild). A comprehensive physical exam allows our doctors to compile a list of clues that can help uncover disease. Early detection and treatment are essential to avoid undue suffering and to prolong the quality and longevity of your cat's life. Watch for subtle changes in your cat's body weight, appetite, water intake, urination and bowel habits, as well as general attitude and activity level. These changes may signal liver, kidney, thyroid or heart problems. Lumps and bumps under the skin may seem harmless, but can be cancerous. Ear infections are common conditions that may not become obvious until seriously advanced. A comprehensive physical exam is the basic tool our doctors use to evaluate your cat's health status and to help you make informed decisions about the care of your feline companion. Health examinations, performed twice yearly, will help determine the general well being of your pet and identify potential problems. Early detection ensures prompt action that may solve the problem before serious consequences occur and may prevent suffering. Your veterinarian will ask you questions about the health history of your cat. Be sure to discuss any unusual behavior with your veterinarian. Medical records will be consulted if your cat has been a regular patient. Notes will be made about your cat's diet, water consumption and on a variety of daily behavior patterns that relate to your cat's health. Temperature, pulse, respiration rate and body weight will be noted, then your veterinarian will begin the physical examination from nose to tail. The nose is not the health barometer that some people think it is, but it is a good place to start. Your veterinarian will check your pet's nose for abnormal discharge and changes in color, texture, moisture or shape. You'll probably be asked if your cat has been shaking its head or scratching at its ears. Have you noticed any odor from the ears? Your pet's deep, curved ear canals provide protection for the inner ear, but these canals also provide a snug home for parasites, infections and foreign objects. A visual check will be made. Many conditions, such as anemia and jaundice, often are discovered through eye examinations. Often, cataracts are some of the first noticeable symptoms of diabetes. Your veterinarian also may observe the inner structures of the eye. Problems such as glaucoma, retinal defects or local inflammation may be noted. Injuries, ulcers and lacerations of the eye can also be detected. Oral hygiene is extremely important. 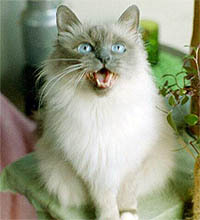 Your veterinarian will check your cat's gums, teeth, tongue and palate for abnormalities, tumors and infection. A dental examination is important for detecting gingivitis, periodontal disease and infected teeth. Teeth cleaning and polishing may be recommended at this time. Your veterinarian will use a stethoscope to listen to your pet's heart and lungs. If any irregularities are noted, additional tests may be necessary. Early heart disease and respiratory problems are often recognized during a regular health exam. The skin is the body's largest organ and a good indicator of your pet's health. Your veterinarian will examine the condition of the skin and fur as a means of detecting other health problems. Your cat will be checked for fleas, ticks, other external parasites, tumors and wounds. Your veterinarian will use hands and fingers to feel the abdomen. This sense of touch will help to assess the condition of internal organs and to detect tumors or other irregularities. The legs and feet of your cat will be checked. The condition of joints, muscles, skin, lymph nodes and hair also will be noted. Immunizing your pet against disease is one of the best tools of preventive medicine. Cats can be immunized against feline panleukopenia (distemper), rabies, feline rhinotracheitis, calicivirus and feline leukemia. Health threats vary from city to city and even in various sections of cities; therefore, your veterinarian can tailor an immunization program for your cat based on local conditions and keep your pet protected with the latest vaccines.